"There's a tide in the affairs of men which taken at the flood leads unto fortune." - William Shakespeare. It means "Now or Never!" Now is the time we EXPOSED the LIES and DECEIT of the EVIL DOERS within and outside IPOB or Never! Recall that in recent time, some principal Officers of IPOB were expelled from IPOB leadership due to their insubordination. This had happened during the period of the unlawful incarceration of the IPOB supreme leader, Mazi Nnamdi Kanu in the Nigeria Kuje Prison. Since their expulsion from IPOB, these former principal officers have been nothing but trouble and they are doing everything they can to dismantle IPOB so that its people will continue to remain in perpetual slavery and untold hardship being subjected unto them by the Nigerian government. 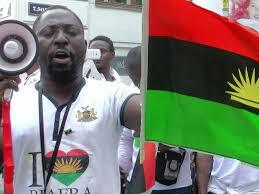 Also recall that IPOB only mission here, is to have Biafra restored back on earth, nothing more, nothing less. These political jobbers masquerading as freedom fighters have also taken to Facebook, with numerous fake accounts, lying and trying to deceive the gullible ones among us to back down from the struggle for Biafra Independence which Mazi Nnamdi Kanu-IPOB is proposing. But little did some of our people know that these Facebook gossipers speaking and writing ill of IPOB efforts to get Biafra are the agents of Lucifer from the pit of hell, and they have been sent into this world to stop the KINGDOM OF GOD (Biafra) from being restored on this very earth. However, nothing stops Biafra from coming because it's a spirit, and it has been ordained by God Almighty (Chiukwu-Okike-Abiama) Himself. When the Lord says "Yes," who in his right senses can say "No?" Using cross-examination techniques to expose the lies and mindset of a saboteur. I propose to use only a series of short questions beginning with HOW, WHEN, WHERE & WHY in a series of lectures to illustrate that anybody who claims there are no saboteurs in this our noble struggle for Biafra restoration is a complete fool not worthy of your attention. What our Directorate of State (DOS) did in early 2017 in suspending and subsequently expelling those insubordinate TRAITORS is the best thing that could have happened to IPOB. I will prove this morning and in the coming days that only those with questionable character and dubious mindset filled with the spirit of envy fell for the scam and lies of the expelled traitors. If you are one of those inordinately ambitious demon possessed Facebook 'intellectuals' that yaps about unity and coalition always, allow me to put your ignorance to an end with facts and figures. As with every forensic analysis, assuming a majority of us are blessed with the attribute of an analytical mind, is to start from the very beginning. 1. Ask the traitors and saboteurs now clamoring for coalition through their surrogates, why did you leave IPOB? What crime did you commit that necessitated your expulsion from our governing council the DOS and wider IPOB family worldwide? These are simple questions. You will notice that they will never answer this question straight but instead will go on to blame Mazi Uche Mefor when he had nothing to do with it. If you are an honest arbiter or referee you will insist they answer this question truthfully and honestly before listening to their litany of lies as to why they had to disobey a direct order. But because a lot of Igbo men and women are natural born gossipers, they stop their interrogation once they avoid the question and go into the reason as to why they had to disobey an order from the very top. Unless you are a seasoned analyst and determined interrogator you will fall for their emotional clap trap about how Director is in Kuje under the influence of drugs and can no longer lead IPOB or take sensible decisions. That is how evil they are. These traitors feed people lies in order to mask their insubordination. The reason why they were expelled is simply because they failed to obey a direct order, nothing more nothing less. And what was that order? "THOU SHALT NOT TRANSMIT THE SIGNAL FROM RADIO BIAFRA TRINIDAD & TOBAGO INDEPENDENT OF THE PARENT RADIO BIAFRA BASED IN LONDON." This decision was agreed unanimously at a DOS meeting attended by these conspirators. For reasons best known to them they set up Radio Buhari International as an independent outfit because they wanted power and nothing else. They knew they were breaking their sacred oath and the cardinal Command and Control principle upon which IPOB was founded yet they went ahead to disobey a direct order. They know in IPOB every disobedience is tantamount to insubordination which is punishable by suspension or expulsion. They know nobody is above the law in IPOB including Director himself. They know the principle of 'obey the last order' and the last order to them was simply, "do not go ahead with the opening of a new radio station if you know you will not route the signal through our main studio in London." Simple and short! There was no problem before this or after. Simply to obey a simple order they can't. The same command and control they too used to expel people. It is left for reasonable Biafrans and outsiders to ask these traitors why they disobeyed a direct order from the highest command of IPOB if their actions were not premeditated and conspiratorial. Now my final question..... who funded and supported them to open a rival radio station to Radio Biafra? What was their motive in naming their station Radio Biafra International if not to destroy Radio Biafra and IPOB from within.